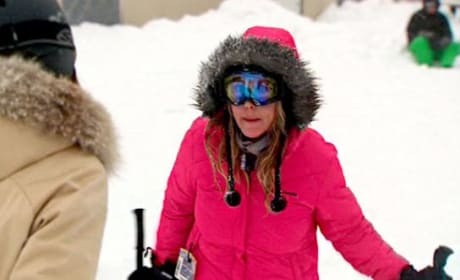 Vicki and Lauri threw down on the ski slopes after Vicki admitted she and her former husband both cheated on one another. But Lauri took it a step further by spreading the rumor that Vicki had not one, but multiple partners in adultery. No surprise that Vicki took offense. The Real Housewives of New Jersey kids were going diva and Ramona's going bug eyed in NYC, but Vicki could teach Miley Cyrus a little something about tongue action with her lollipop video on The Real Housewives of Orange County. Hello, The Real Housewives of Orange County. The ladies pose here for a promo pic.